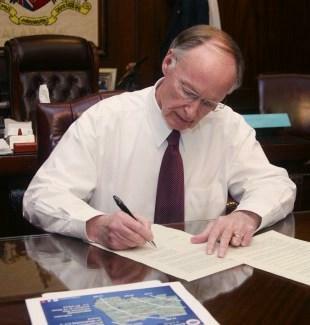 Alabama Governor Robert Bentley came out to defend the state’s closure of dozens of driver’s license offices after Congresswoman Terri Sewell said she was pursuing a Department of Justice investigation. Bentley sent a letter to U.S Representative Terri Sewell yesterday responding to Sewell's criticisms. She has asked the U.S. Department of Justice to investigate since Alabama requires a photo ID to vote. She says the closures disproportionately impact poor and African-American populations. The governor called Sewell's comments "ill-informed." He says the state provides free voter IDs in each county independently of the driver’s license offices. The Alabama Law Enforcement Agency announced last week that it would no longer send personnel to its satellite offices. The closures impact the issuance of new licenses. County workers handle renewals and replacements. The offices were staffed one to three days a week. They issued between a few dozen to a few hundred licenses and permits each last year. The fallout continues from Alabama’s new general fund budget. APR student reporter Taylor Swinney reports the fiscal year has just begun and the impact is now being felt. Alabama’s Law Enforcement Agency says there will be fewer state troopers on the road to help out with major events like Mardi Gras and races at Talladega. The department is facing a budget cut of eleven million dollars. The reductions take place as the state consolidates twenty law enforcement agencies into one big unit. One cutback that’s already taken place is satellite driver’s license offices. The agency is closing 31 of them to save just over $1 million. The Alabama Law Enforcement Agency isn’t the only arm of government to see budget cuts. The Alabama Department of Environmental Management saw its spending plan reduced by a reported 96% since 2008. State lawmakers also want ADEM to hand over $2 million in fees it collects every year for things like solid waste disposal. Veterans looking for employment will have a chance to find a job that’s fit for them. CivilianJobs.com is hosting a job fair in Huntsville. The group is looking to hire over 150 ex-military members. ADT Security Services, Alabama Foundation Specialists, and Airstream Renewables are among those looking for new workers. Jake Hutchings is the General Manager for CivilianJobs.com. He says it's important to prepare for the job fair. The job fair will be held at Redstone Arsenal at the Summit today from 10AM until 2PM. You can register for the event at CivilianJobs.com. Alabama Public Radio's morning newscast for October 7, 2015.